"IF WE CAN'T MAKE THEM HAPPY, THEY CAN MOVE!" After months of dealing with unresolved maintenance issues ranging from backed up drains and appliances not working to significant mold and broken A/C units, Latina tenants at Union on Thompson apartments came together to write a letter to their management company, Elmington Properties. In addition to maintenance issues, we had not been given access to our leases in Spanish, meaning that many of us were obligated to sign contracts that we could not read (see Contributor article HERE). In July of 2017, we held a meeting with Elmington Management outlining our concerns and requesting maintenance improvements, better security and access to bilingual lease contracts. Elmington responded by addressing many of the maintenance concerns, replacing management staff and promising to provide leases in Spanish. Fast forward to February 2018. Significant maintenance issues continue to be left unaddressed and when we have brought maintenance issues to the attention of management, many of us have been served notices of non-renewal with no reason given by management. We have organized are are holding management accountable for their treatment of tenants. 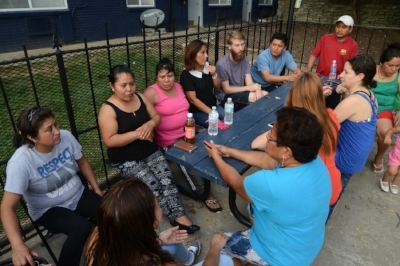 This is just one example of many similar interactions where Spanish-speaking tenants have been treated in a disrespectful and dehumanizing manner. As of today, Feb. 13th, we have been told we will not be renewed and have yet to receive any response to our maintenance requests. All that we are asking is the right to live in a safe, maintained home without fear of retaliation when we bring concerns to management. We are rent-paying customers and we deserve livable conditions and to be treated with basic respect. $6 Billion Public Transit Plan for Nashville? Only if it benefits ALL of Us! On Thursday 6 July Homes For All Nashville encourages you to support the Tennessee Immigrant and Refugee Rights Coalition. Austin Sauerbrei describes early results from a new tenant union. Toni Smith of Park at Hillside Tenants' Association (PHTA) reflects on the changing city and her future hopes. Nashville has an urgent and growing shortage of affordable housing, but incredibly, funds for affordable housing may be cut in Tuesday 13 June's Metro Council meeting. Have YOU been displaced in 615? Have you been forced from your home by rising rents, unjust eviction or abusive landlords in Nashville? We believe that story-telling and shared experience is a great way to build movement for change.